If your baby is suffering from a mild fever as a result of either the flu season or other causes like teething or vaccination, home remedies are the best way to treat it. Fever is a common illness, which everyone will face now and then, especially children. Fever must be brought down gradually and these few home remedies for fever in babies will surely reduce the body temperature of your little one and make him more comfortable. A child’s sneeze is enough to cause any parent to worry and here we are referring to fever. Well, fever is not a major illness, it is usually a healthy response of a body’s immune system to a virus or bacterial infection. When a body is attacked by viruses the body becomes feverish in order to kill those bad pathogens. There is no need to focus on medication for fever in babies, however, extremely high or persistent fevers may need emergency medical consultation. There are various home remedies for fever in babies which helps in lowering the temperature of babies. Fever in newborns or babies up to 3 months of age is a matter of concern always. Get the medical treatment done at any temperature higher than 100.4 degrees Fahrenheit. In a baby of 3-6 months of age, a temperature of 101 degrees and up is considered high and a fever of 102 degrees and up in a baby of 6 months of age is high and needs immediate medical consultation. 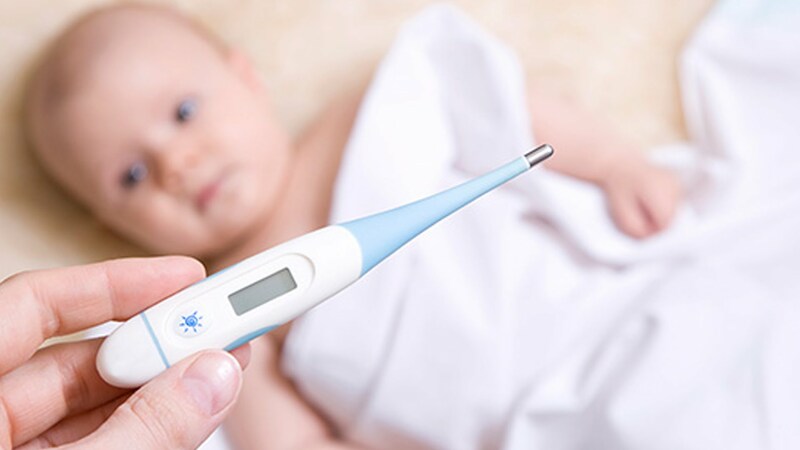 In any situation, in addition to pediatrician's prescribed medication, you can follow home remedies for lowering the body temperature and reducing the fever in babies. Put a cool, wet washed cloth on your little one’s forehead. As the water from the wet washcloth evaporates from the skin, it will cool your child and bring his temperature down quickly. This age-old home remedy for fever in babies is the easiest method of lowering down the baby’s body temperature. A proper lukewarm water bath or sponge bath will ease a fussy baby with the lowering of his body temperature. Never use cold or hot water as it may increase the body temperature. Do not rub alcohol (an age-old home remedy for fever in babies) since it can cause a temperature rise and possibly even alcohol poisoning in the child. If your baby is on breastfeeding, try to feed him frequently. Breast milk is easily digested and will strengthen the baby’s weak immune system and help to fight against the virus. If your baby is of age 6 months and above you can offer him liquids other than milk too to keep him hydrated. Along with water and oral rehydration solutions, cold milk, ice pops, fruit juice, and yogurt can be given to babies 6 months or older. These home remedies for temperature in babies will help cool the body from the inside out. So that your baby can lose body heat more easily. Dress your baby in one layer of cotton clothes. Change your baby’s clothes once it becomes soaked with sweat. If needed, use a light blanket to cover him when he is sleeping. Keep the room temperature normal. In addition to medicine and above said home remedies for fever in babies, you should take care of your baby’s food to help him relieved from fever. If your baby is over 6 months and has started eating solids, then here are few foods to be given during fever to help him boost his energy. Dal khichdi with ghee is the best food for your child. Dal khichdi is easy to digest and provides all the essential nutrients whereas ghee aids digestion and boosts immunity. Try giving your baby vegetable soups. It will supply all essential nutrients to the body and help to alleviate any tiredness. Sago is known for its property of regulating body temperature and thus recommended to eat while suffering from fever. This home remedy for fever in babies will keep him hydrated and help to alleviate the temperature. Dalia porridge, rice cereal, curd rice(only if your child is above 11 months and not suffering from cold), fruit and vegetable puree are all energy boosters and help your baby to fight against pathogens. Use turmeric while preparing your baby’s food. Both the ingredients are antibiotic in nature and help to fight the bacteria and reduce body temperature. Keep a regular check of your little one’s body temperature and call the doctor immediately if he shows other symptoms along with fever. Till the time help him lowering down his body temperature with the effective home remedies for temperature in babies. Check out the Parentlane App today to get more insights into your child's health and development.